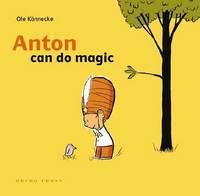 Anton has a magic hat. A real one. Anton wants to do some magic. He wants to make something disappear ...First Anton tries to make a tree vanish, but it's too big. He manages to make a bird disappear, and even his friend Lukas. But where did Lukas go? Ole Konnecke was born in 1961 and spent his childhood in Sweden. He now works as a freelance illustrator in Hamburg, Germany. He has written four books about Anton and has won many awards, including the German Youth Literature award in 2005.